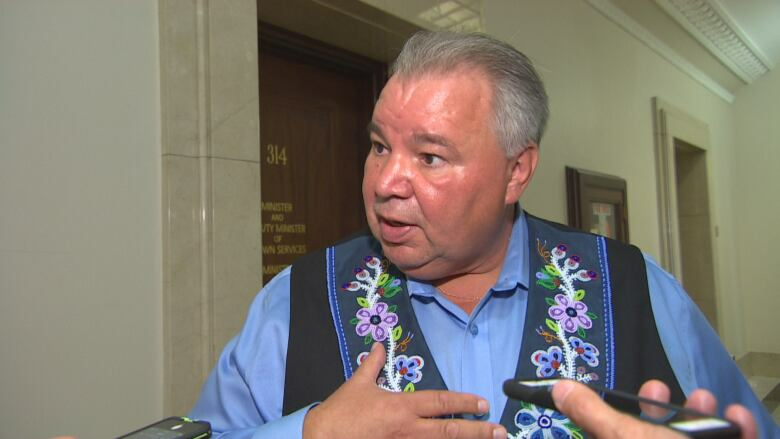 The leader of the Manitoba Metis Federation says his first meeting with the province’s new Crown services minister made little headway on disputes surrounding a quashed deal with Manitoba Hydro. The leader of the Manitoba Metis Federation says his first meeting with the province's new Crown services minister made little headway on disputes surrounding a quashed deal with Manitoba Hydro. MMF president David Chartrand met with Crown Services Minister Colleen Mayer and Indigenous and Northern Relations Minister Eileen Clarke at the legislative building Wednesday afternoon. "I was expecting and hoping there was maybe a new olive branch given out to discuss other matters, but more it was at this point in time, they can't discuss beyond, 'I want to meet you and get to know you,'" Chartrand said to reporters after the meeting. The MMF filed a lawsuit against the provincial government over a $67.5-million deal struck between Hydro and the MMF but killed by Premier Brian Pallister in the wake of mass resignations at the utility last March. The agreement would have assured MMF support for the $453-million Manitoba-Minnesota transmission line, targeted to be completed and send power to the U.S. by 2020, as well as other Hydro projects throughout the province over the next several decades. Chartrand believes the federation has a good chance of winning its case, but even if the MMF loses, Chartrand said the province will have failed to fulfil its duty to consult affected Indigenous groups. "Even if they win, they lose. First, they're not protecting Manitoba taxpayers ... by their actions, because if they were to hold us back, they're going to cost us a hell of a lot more money. Americans will probably be quickly reacting if the licence is not issued, because there's a deadline they've got to meet there too." A spokesperson for the provincial government said it is committed to "mutually respectful relationships between Indigenous and non-Indigenous peoples. "We are committed to advancing reconciliation with the Indigenous peoples of this province. Reconciliation and consultation requires that parties communicate and listen to the perspectives of others. This is what we hope to achieve through our engagement with the MMF. We will not be discussing matters currently before the courts," the spokesperson said in an email statement. The National Energy Board is currently holding public hearings on the Manitoba-Minnesota Transmission Project. The MMF has raised the issue of their agreement during the hearings, but in June a lawyer for Hydro told the board there had never been an agreement with the federation. The Manitoba-Minnesota transmission line is scheduled to provide electricity generated by the Keeyask hydroelectric dam to customers in the U.S. Hydro has signed contracts with utilities south of the border.